I hope your week is going well and you’ve had some time to shop! A few weeks ago, I shared a teaser about a kitchen that I just finished up for a local Client. The transformation is pretty spectacular and the space not only looks amazing and is now completely updated, the way it functions is SO much better. 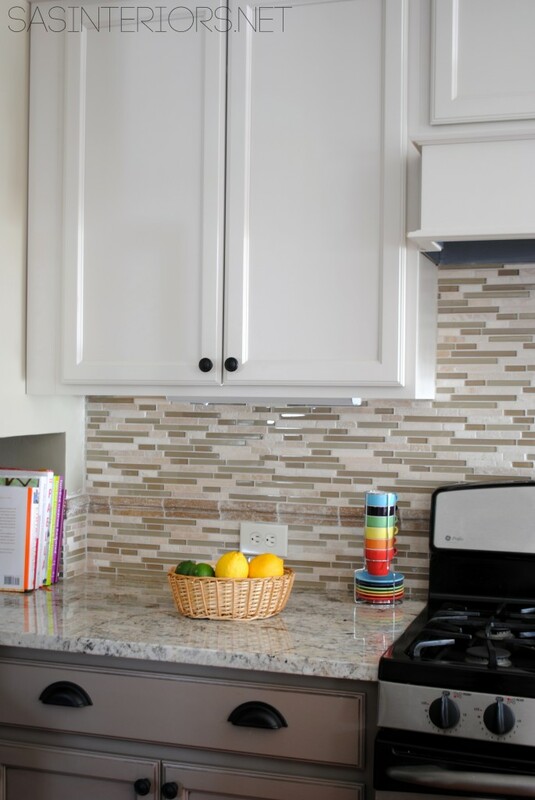 There was about 12″ of unused space, so we brought the new cabinets to the ceiling plane which allowed for additional storage, plus the taller cabinets heightened the entire room. The wall that separates the living room and kitchen was extended to define each space more. The layout is still an open concept, put eliminating the angled wall allowed for more definition and cabinet space. Enough said about that! The client wasn’t sad to say bye-bye to the old white cabinets. 4. Same with the countertop – dated! 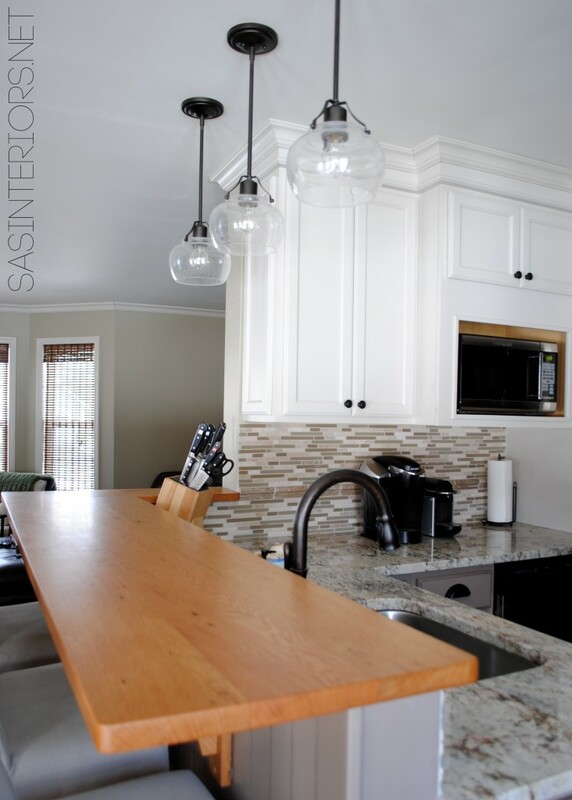 The turquoise blue countertop wasn’t a color that they wanted to keep, so that also had to go! Figuring out a new location was tricky! In the end, there was a pipe chase on the other side of the room that was boxed out around 1 pipe. It was crazy that this crucial floor area was going unused. After calling in a plumber and electrician to move the pipe location, the new-found floor area resulted in the new home of the refrigerator. 6. With the refrigerator location moved, wall space was freed up for more cabinetry = more storage! 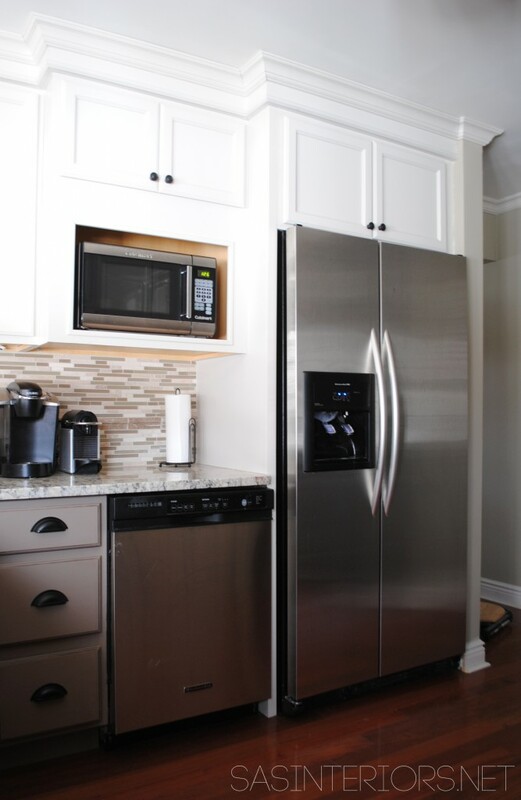 The unused wall space next to the ‘before’ refrigerator allowed us to create a beautiful “china-style” cabinet. 7. Last, but certainly not least was the removal of the “popcorn” ceiling. “Popcorn” ceilings create shadows resulting in the space feeling not as high as it actually is. It’s a pain to take down, but well worth it. 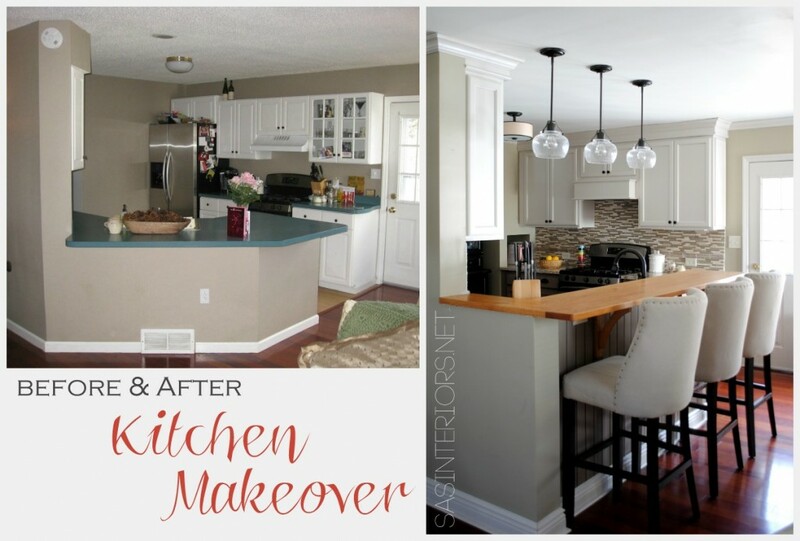 For this Kitchen Makeover, the clients tackled it themselves (using Brittany’s tutorial) and they did a damn good job! The cabinets are all from Lowe’s and the team their was very helpful. 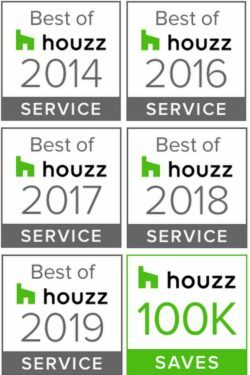 I worked with the Client every step of the way in choosing the three-toned cabinet colors and all of the other selections. The Lowe’s team was great at helping us with all the nitty-gritty cabinet sizes and options. 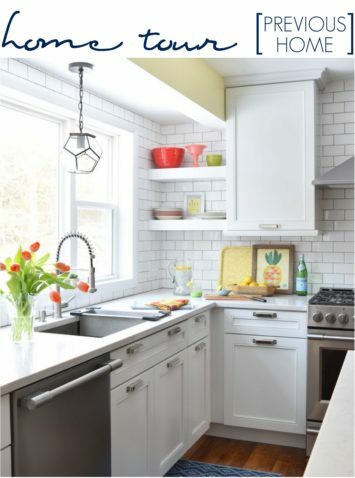 Tackling a kitchen makeover is quite an endeavour, but if planned out correctly from the start, the process doesn’t have to be overly grueling. My best advice is to plan ahead and choose / purchase all the new selections before anything in the space is touched. Holy cow! that looks awesome! They must be thrilled to say the least! I love it and I really like where the refrigerator is now and having that storage unit! Great job! i love all the changes! wonderful makeover! 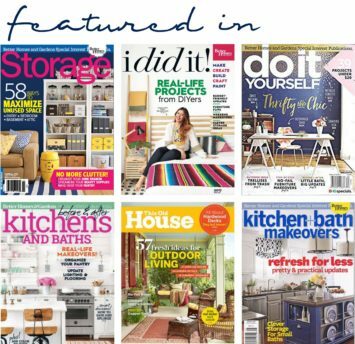 Wow – what a great transformation you accomplished for your client! My favorite part is the new-found space for the china cabinet! 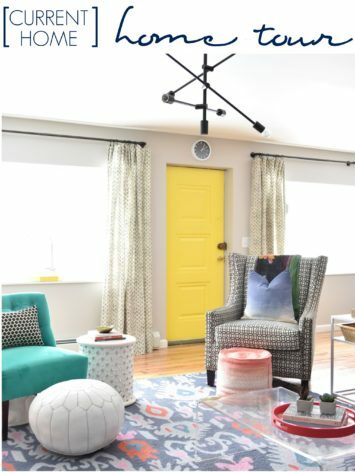 Love the whole thing, but I’m especially focused on the way you squared off the angled wall. 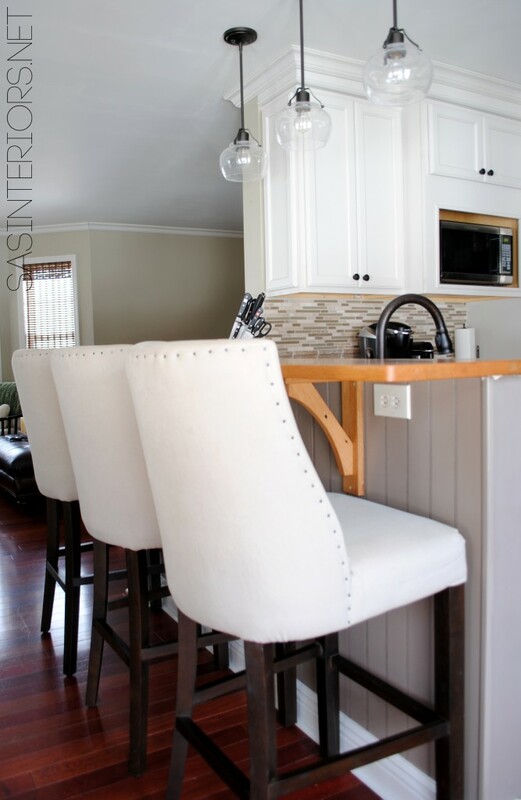 We have a very similar “peninsula” that angles out and has barstools on the other side. Squaring it off like that never even occurred to me! Not sure it would work with our particular layout, but definitely pinning this as a strong possibility! Great job! The entire transformation is just beautiful Jenna! Wow!!! I love the combination of everything, and that hutch is such a great way to personalize the space. Nice work! Oh my goodness! I love the new look of the kitchen. I especially like how you changed the shape of the bar. It looks amazing. What a beautiful transformation Jenna. I’m so impressed! 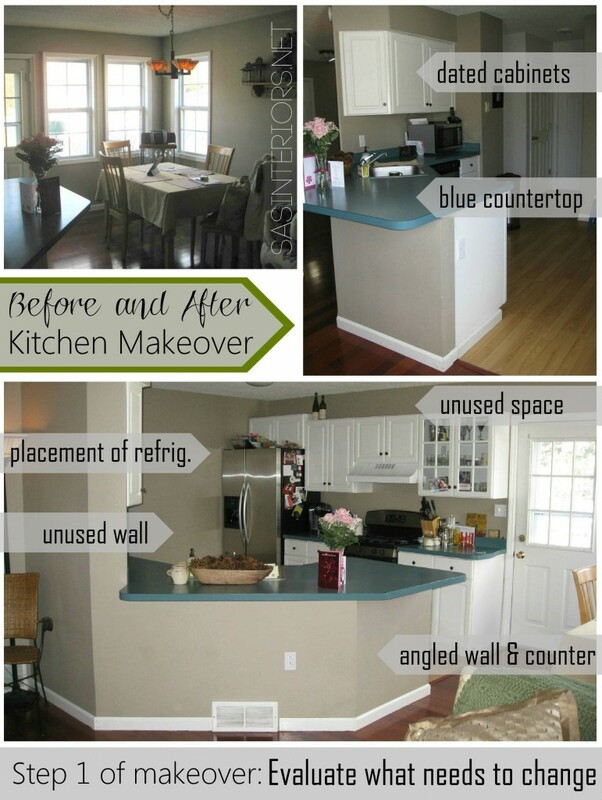 Amazing kitchen makeover! There’s a lot to learn from this blog article. 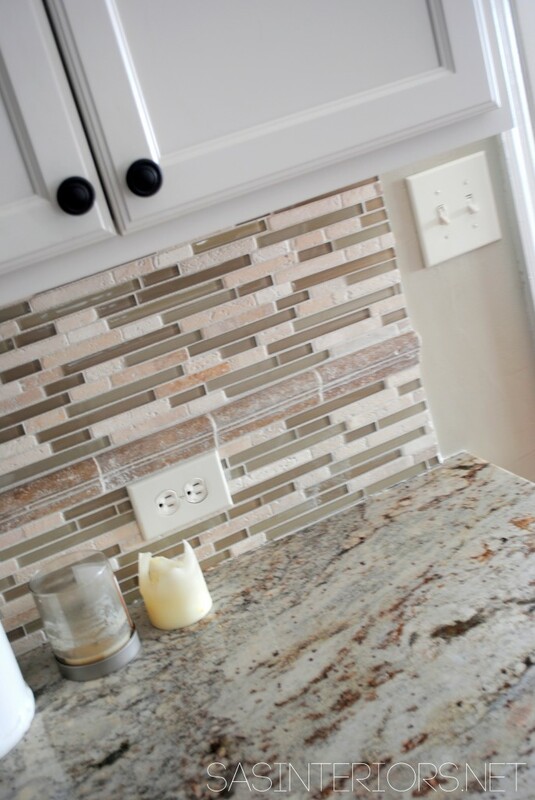 I love the backsplash, it looks amazing with the rest of the kitchen. Great tips. Thank you! Have you ever used Bondera Tiles MatSet in your home improvement projects? It’s great for installing wall tiles or countertops. Here’s a little preview – http://www.youtube.com/watch?v=JegIxRKab_8. You’re truly talented! That is GORGEOUS! I would also like to know this! And the paint colors you used please! 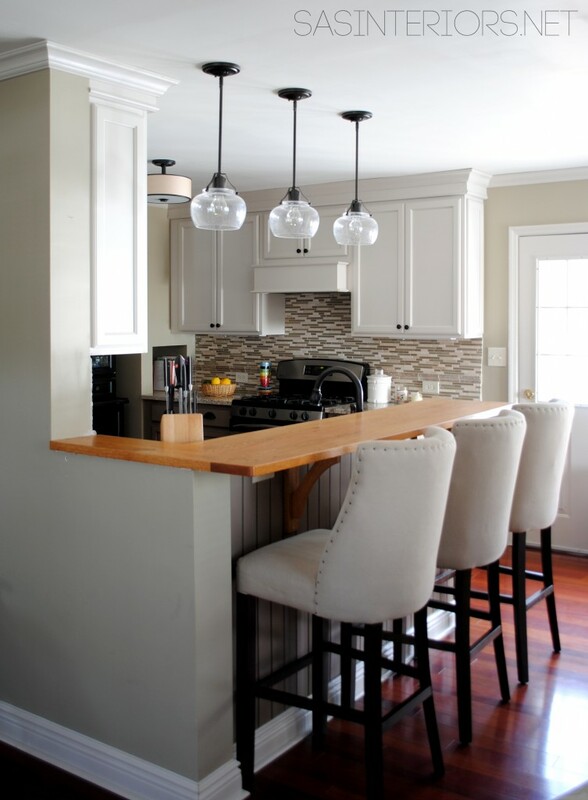 What paint color did you use for the cabinets? The cabinets was from Diamond, available at Lowe’s, but I don’t recall the exact color. Whhat is the name of the crown molding you used throughout your house and where did you get it? Also what is the name of the molding you used on your cupboards? I’d love to do this but I would have to do the crown molding around my house too. It looks beautiful! Thank you for sharing.